Sometimes, it all just becomes very grown-up. You go to work, drive your car, pick up kids from kinder garden, school, or whatever party they went to on Friday night, you struggle to decide what to have for dinner. You pay your taxes, buy toilet paper and cleaning supplies, check your e-mail, make packed lunches. That is one of the reasons why I am so happy that my job as curator for The Ethnographic Collections allow me to continuously connect with my inner child. And few things fill me with a bigger sense of childish joy than opening one of our brown, dull looking, acid free cardboard boxes, and uncovering a really awesome knife. If I am lucky, it comes with a beautiful scabbard, and I get to draw it (and enjoy the accompanying sound), before I battle invisible enemies in the low ceilinged halls of our storage rooms. And here I must apologise to my former colleague Thomas, who on numerous occasions felt my enthusiastic blade wielding was a little too close for comfort… I blame my inner child. One of my favourite types of knives are the African throwing knives, of which the main image of this blogpost is one. 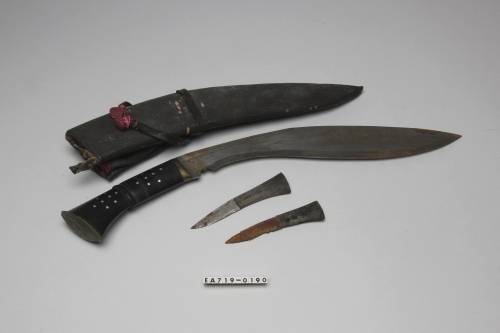 These knives are found, among others, in The Democratic Republic of Congo and Sudan, where this knife is from. It was collected among the Nuer tribe in 1959. But aside from the cold facts, you must admit that it is just a pretty damn cool object. Beautiful curved dagger, collected among the Beja people in Sudan between 1984 and 1991. 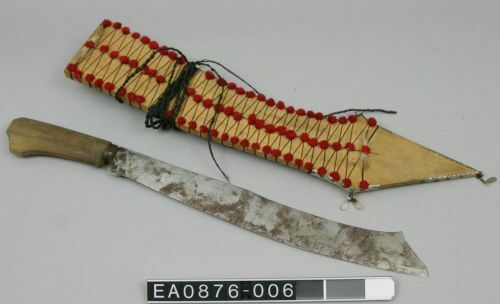 Long knife with accompanying ‘leech scraper’, collected among the Orang Bukit in Sarawak, Borneo, in 2010. 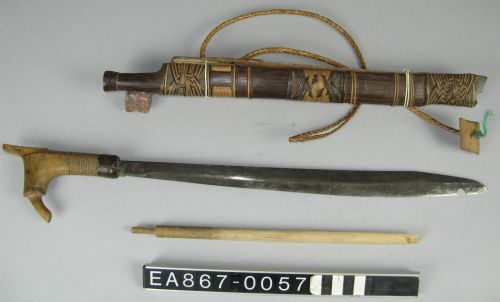 Headhunting knife, previously used for ritual headhunting among the Ilongot in the Philippines. It was collected in 2010, when headhunting had not been in practice for about 40 years. what you have is an Ingessana knife, Sudan, Blue Nile province. Thank you for the comment, Wolf-Dieter Miersch! 🙂 And you are indeed right, according to our database, it was acquired in the village of Wisko in the Ingessana province in 1959. Such a beautiful weapon.